Mohnblumchen offers affordable Italian cuisine in Kolonaki. 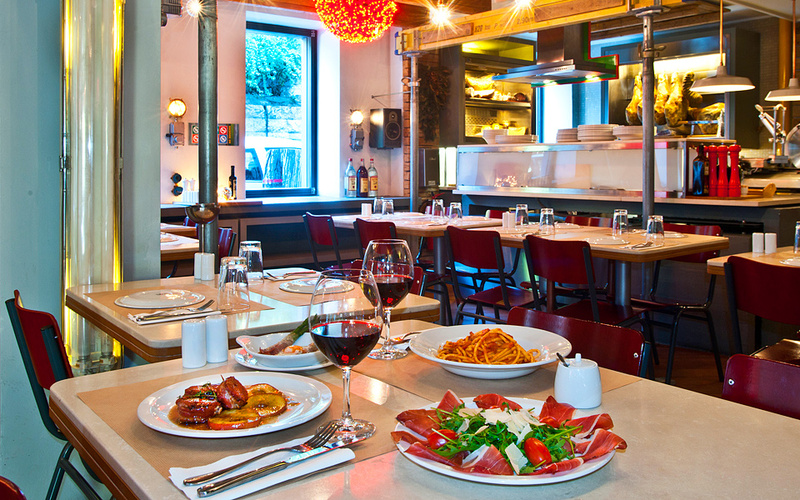 Italian cuisine for the masses in Kolonaki. Sometimes you just need a little push to take the first step and Mohnblumchen on Plateia Dexamenis Street was just what I needed. This place is just the right distance from the hubbub of Kolonaki, in close proximity but at the same time tucked away. The restaurant sits at the venue of where a famous boutique was once housed, retaining its industrial retro aesthetic and a pleasingly modern aura. We started with a simple green salad with chinese cabbage, iceberg lettuce and mustard vinaigrette. Even though they’re not in season, we couldn’t resist trying the baked egg and asparagus wrapped in prosciutto, which was very good. We moved straight on to the mains. We tried the very good saltibocca alla romana, the signature dish of Rome, with veal, prosciutto and sage which was accompanied with baby potatoes. I was impressed with how good the turkey fillet with mushrooms and marsala wine was – I’d highly recommend it to anyone on a diet, you won’t feel like you cheated, but maybe skip the penne a la vodka with tomato sauce, pancetta, cream and vodka. The pasta was a little over boiled, but still perfectly edible. We went for a quick lunch and ended up leaving in the evening. When we got hungry again, we ordered a platter of cold cuts. Another plus point is the good selection of wine at reasonable prices and the very good grappa.